Edison Smith is particularly renowned for his Sterling cuff bracelets characterized by highly detailed stampwork and repoussée stars. 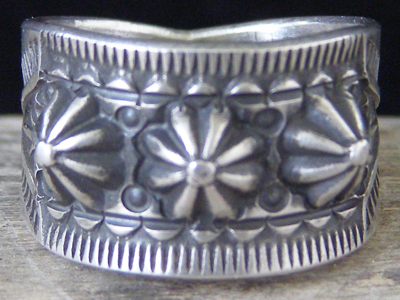 This ring is made in the same style with every bit of detail that is his stock in trade. He smiths silver without the use of electricity and seldom sets stones in his work. Hallmarked ESS and stamped Sterling under a star.